Irina Argo’s “Vampire Elite” wows with intriguing mythology, fascinating characters, and a tantalizing plot. 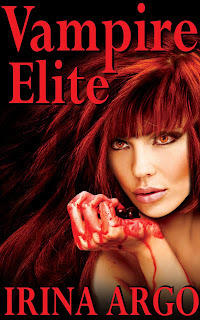 Set in a variety of exotic locations, such as Greece and Venezuela, the book, follows the ages-long battle between vampires and the Amiti, a race created by the Egyptian goddess Hathor to unlock the love of vampires. One of the novel’s strongest points is its usage of the interplay between relationships and politics to drive the plot forward. Case in point, it is Simone, the child of the former Queen of the Amiti and the King of Vampires, who takes the initiative to protect the new Queen of the Amiti, Arianna. The story shifts perspectives occasionally, giving the reader a spectrum of viewpoints, truly allowing a connection with the characters. Although the plot is fast-paced, Argo does not neglect the lore behind the Amiti and the vampires, fully explaining their history and capabilities, such as the blood-bond. The government structure of each group, such as the Amiti’s Keepers, play an important role in the plot and are described in a way that keeps the reader interested. The tie in between the Amiti, the vampires, and Egyptian mythology is seamless and adds a layer of realism to the story. The novel is such a complete package that it’d appeal to anyone who loves a story with a fast-paced plot and fascinating characters, whether they like vampires or not.